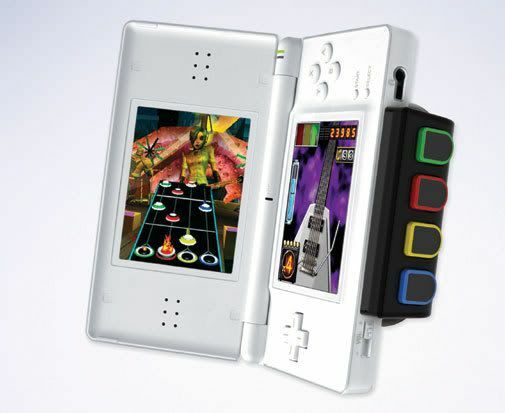 If you're not familiar with Guitar Hero, it's a video game that involves using a console that is the size and shape of a real guitar. Players follow prompts on the screen and "play" by matching up sequences on the screen to what's on their guitar. And of course, it's all to music and swept the nation in the last few years, leading to bizarre stories about how much parents were paying to get certain games and one parent who sold a hard-to-get Guitar Hero III game for $9100 after catching his son smoking pot. I told you....craziness. It's like Tickle Me Elmo all over again, but involving adults who want it just as bad as teens and younger kids.....and are willing to do more than simply plow over other anxious parents in the mall. Anywho, Nintendo has brought out a version for the DS...a small, compact handheld console....an upgrade to the Gameboy, if you're familiar with those (I've noticed a huge variety in my audience nowadays...if I mention something you don't know about, tell me, and I'll be sure to explain more!). There's no huge life-size guitar this time, but rather, an attachment that you can put on your travel-size game player and have at it! The link below the picture up there has a rather cool video animation on how it's played. Beware, there's sound, so if you want to listen, make sure you have other things turned down and your volume at a tolerable level so you're not bombarded. I have to admit that we are a Guitar Hero house. We recently ungraded to Rockband. But let me tell you, when people come over, they want GH, not our company. :) We recently had a party that turned into a Rockband allnighter. Crazy.